The new Fujifilm XF 8-16mm F2.8 R LM WR takes the title of being the best wide-angle zoom lens in the Fujifilm XF range from the older XF 10-24mm optic. Compared to the existing XF 10-24mm lens, the Fuji XF-16mm offers a wider angle of view, is one aperture stop faster, and is also fully weather-sealed. On the flip-side, unlike the 10-24mm it doesn't feature built-in image stabilisation, it's bigger and weighs twice as much, it costs almost twice as much, and it doesn't accept screw-in filters. In terms of image quality, the XF 8-16mm is razor-sharp throughout its zoom and aperture range in the centre of the image, and acceptably sharp from f/4 onwards at the edges, out-performing the XF 10-24 F4 lens by quite a margin. Vignetting is practically a non-issue, and chromatic aberrations are only noticeable by their almost complete absence. Barrel distortion is also very well controlled, even at 8mm, an amazing performance given the ultra-wide-angle focal length. The close-focus point of 25cm comes in handy when including foreground interest in the image, as you often do in landscape and architectural photography, or for taking close-up street photos, while it is possible to creatively throw the background out of focus using the maximum F2.8 aperture. The Fujifilm XF 8-16mm F2.8 R LM WR's linear-motor-driven auto-focus system is fast and quiet. As with most Fujifilm lenses, it features a very welcome aperture ring which makes it quick, easy and precise to set this key element of exposure, especially as the aperture values are marked on the lens (unlike the XF 10-24mm). Note that there is no focusing distance scale with depth-of-field markings to make it easier to zone-focus. 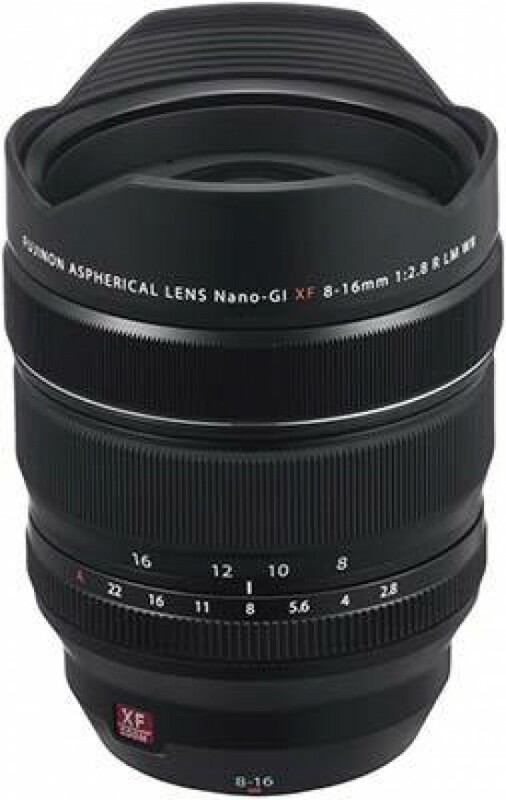 £1799.99 / $1999.95 is a lot of money to pay for any wide-angle lens in any camera system, be it APS-C or Full-frame, making the Fujifilm XF 8-16mm F2.8 R LM WR a lens for the fully committed land/city-scape or astro photographer. If you can't stretch to the XF 8-16mm, the older 10-24mm F4 lens is still worth considering - it's smaller, lighter, cheaper, longer, stabilised, and supports much more affordable screw-in filters. If you want the ultimate wide-angle lens for your Fuji camera, though, the new XF 8-16mm F2.8 R LM WR is the one to get.